It doesn’t seem like I got a lot done today – Not sure why – just does .. I know I’ve been in my cat cave for most of the day strip piecing and cutting, strip piecing and cutting .. I just feel like I should have more done today that I actually do ** shrug .. ah well .. I did do a LOT more cutting today .. I thought I would make it easier on myself to have my strips the size I need for the split 9 part of this particular block I did today .. What I’ve got here are the parts of the split 9 / HST just before I put them all together into their respective parts. This was as close to a brown bag as I could have gotten without actually using one .. harmonizing colours to an extent together (but this quilt is made up of colours that harmonize .. ) or colours that create enough of a contrast so that they don’t blend into the next square. I think I did pretty well in trying to not have the same colours together, but as you can see in these, that some greens did end up together – but the good thing is, they aren’t the same green .. but then again .. I was giving it an honest effort NOT to control this too much .. I did pretty good me thinks! 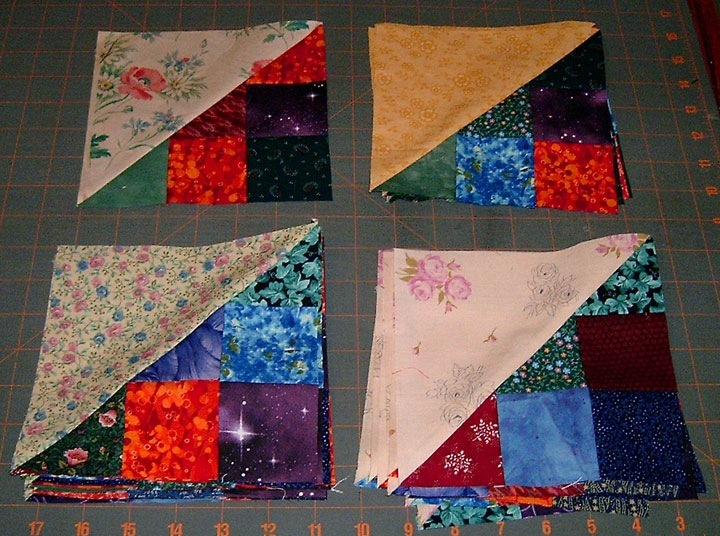 and nothing really clashes here either .. but i won’t know for sure until I get the blocks / squares all together in a layout …. And that’s the next step! I’ve everything all ready to go for the layout part of it … I’m almost tempted to just lay it out on the floor to see how it looks, but that means I have to pick it up again! Not tonite . please not tonite .. This is going to roughly finish up at 60 x 72″ and I’m not sure my design wall will hold all that – width wise, yes .. length .. no .. 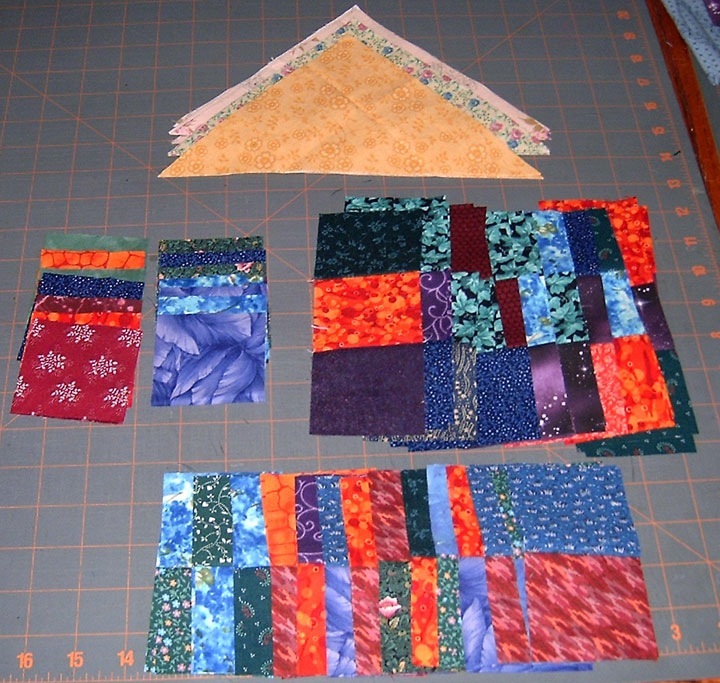 The pattern didn’t call for strip piecing .. but I wasn’t about to sew all 168 2 ½” squares together 1 by 1 .. that would exceed my patience factor! I feels GREAT to have these all squared up ready to go .. no more cutting / squaring for a bit now 😀 Least not with this quilt! Tomorrow Part 6! Thank you, Grace, for your great tutorials. Printing on tissue paper is a good idea. Looking forward to seeing what this will look like, it is a mystery pattern I missed. I know I have a hard time not controling placement in scrap quilts too, but yours is looking good.